Are you the type of person who has to finish a project from beginning to end? A linear type of person? When I was playing RPGs, role-playing games, I hated the ones that were super linear. My mind doesn’t work that way. If I get stuck, I’d want to be able to either figure out a different way to solve a puzzle, or be able to solve another and then go back to that one. That’s how I am with everything. I have a ton of things I’m working on at any given time. I love it when I accomplish something, but I always have several more things take its place. Sometimes when something isn’t working, and I mean with anything, I take a break and work on something else. Like I took pictures of all the birds in the bird feeders. 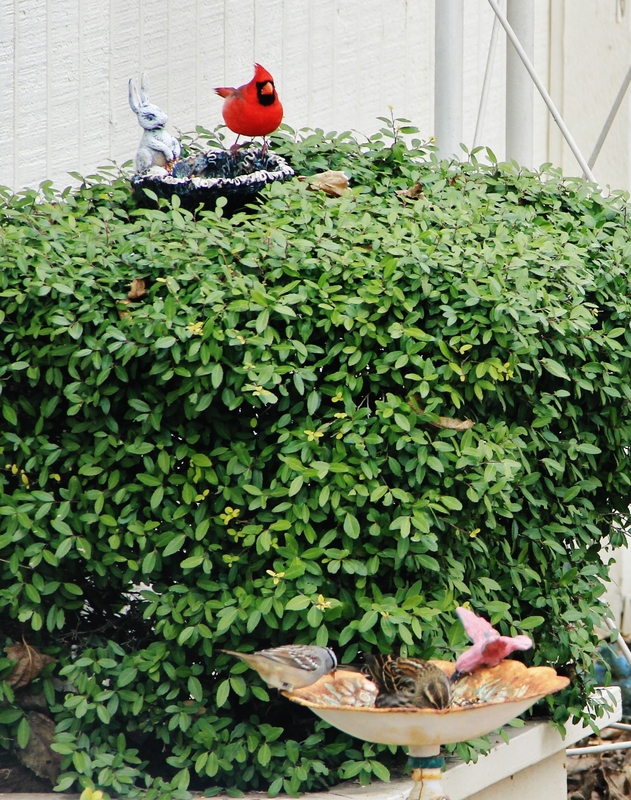 Yes, I know that one isn’t a bird feeder, but the birds don’t know that, so we’re good. I would have written more on Cougar’s Mate, but I needed to take a break, so I worked on two bears for a bear order. Now it’s time to read the last of the Rita books I’m judging. So do you ever do something different so that you can come back to it and then all of a sudden it all falls into place? Is it really Tuesday already? I find that if I am having a problem and not getting it fixed, I also stop. I see someone else with a problem and help them. When I come back to my problem, it is usually gone. Funny how that works. We have now had another 1 2/3″ of rain. Bringing us to 4.75 for this year. Last year it was 19″ by now. At least the rain brought down the fire danger for a few weeks. Looks like we will not have any water in the pond at all. We have an old bathtub in the back that we will have to be filling with water for the animals this summer. We usually do not want to do that as it brings in the mountain lion and the bear very close to the house. These two are some of our four legged neighbors. Sometimes they are more welcomed that the two legged neighbors. May I ask about the cost of one of your bears? I have a 9 year old grandson that loves swimming, track, soccer and baseball. Thinking of getting him one. Sometimes, that will happen for me too, Sand. If I give up on something and do something else. Kind of like when I lose something, and if I quit looking for it, I will find it. Wow, on the lack of rain, and bringing the wild animals to the house. We had problems with bears in Oklahoma. Friends of ours had beehives and a bear tore into them to get at the honey. And in another place where it was much dryer, western Oklahoma, a neighbor had a swimming pool, and the mountain lion attacked their German shepherd to drink water from the pool. So they can be bad news. Thanks, on the bears. 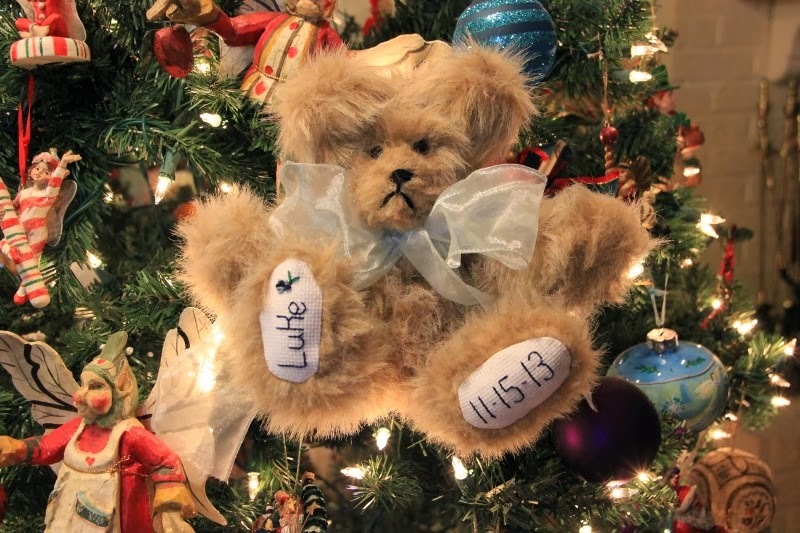 If you get a plain, personalized 10 1/2″ bear it’s $26 + shipping depending on where you’re at. US, $7. I wish I had your stamina and drive ! I’ve fought MS for over 30 yes. All the drugs all the experimental trials, all the needles, I went to a clinic I’m Mexico for over a year. Hyperbaric chamber, lymphoresis and finialy chemo. Nothing worked or helped. Now I’m doing eastern medicine and that is keeping me going, now we found out my daughter,in her 40’s has M S.
I am blessed with a wonderful husband who takes care of me and I’m starting my 4th year bed ridden, so when I read your books, blogs etc. it takes me far away. I have a great imàgination so I can put myself in your books and I love the addition of your bird pictures. Soon I will order a bear!